Dutchess’ love life appears to be heating up in ways she might not have hoped for. The Black Ink Crew star split with longtime love Ceaser shortly before the current season began airing, and, at the time, Dutchess alleged that she couldn’t take Ceaser’s dishonesty any longer. Now, though, two new reports suggest that Dutchess wasn’t being completely honest–and may have actually had two different men on the side. Mood when yur rookie season get cut short early cause of stupid ahh injury … ? 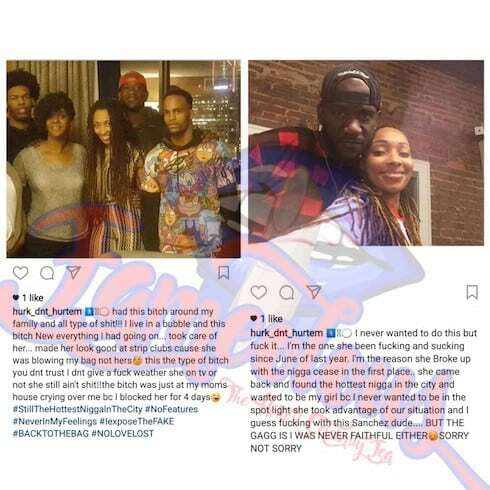 Speaking of scorned lovers, some fresh tea hot on the heels of the Black Ink Crew Dutchess and Zack Sanchez report may have revealed the reason that Dutchess and Ceaser split all along. According to the noted gossipsters at Fameolous, the man Dutchess has allegedly been messing around with since last June came forward to show himself specifically because of the Sanchez story, claimed responsibility for splitting Dutchess and Ceaser, and wanted Dutchess to know that he hadn’t been faithful to her, either. After the Sanchez story broke, Dutchess apparently told Fameolous that she just wants “peace” and that she and Zack “are good.” It’s not clear if she wants to go official with Sanchez, but it does seem like her current beach vacation with the footballer is exactly the right thing to be doing while all this gossip explodes back home. Black Ink Crew‘s season continues Wednesday nights on VH1.